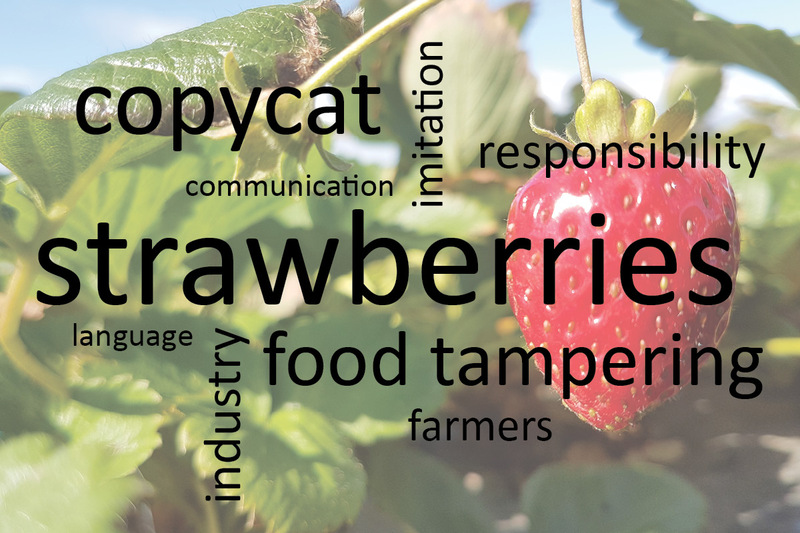 During the past two weeks reports of food tampering of strawberries have resulted in recalls of massive amounts of fruit, criminal investigations, and significant damage to the industry in Australia. While the perpetrator/s has/have not been prosecuted and police are still investigating it may be timely to reflect on how media and indeed other key sources report and communicate these incidents. Anyone who has ever read, watched or listened to a media report on suicide will know these reports contain phone numbers and websites that offer help to minimise harm the report may cause among at-risk audience members. What you might not know is that there is a whole set of guidelines that journalists in Australia follow that recommend the language and what is reported about suicides to reduce harm and prevent imitation. The 2012 Conversation article ‘The facts about safe reporting of suicide’ provides a good summary of the evidence that supports these guidelines and how they came about. The guidelines include recommendations that the method and location are not reported to avoid copycat behaviour and that reports should be moderate, sensitive and not sensationalised. When it comes to terrorism there is also good evidence to suggest that the number and nature of media reports about terrorist incidents can affect the incidence of copycatting. The same is true for mass shootings and a set of guidelines has been produced in the United States to reduce follow-up attacks. It suggests, for example, avoiding speculation, minimising mentioning the perpetrator’s name and not showing photos of their clothes or weapons. Instead, reporters are suggested to present the facts about how illegal and harmful the behaviour was and to tell the stories of the victims. Could the reporting of the initial incident with strawberries have contributed to others copycatting it? Well, at this stage, we simply don’t know. We don’t have enough information to know. We don’t know who was responsible for these crimes, we don’t know if there were copycats (although it is highly likely), and we don’t know if the reports inspired any copycat behaviour. Let’s be clear on that. But knowing what we do know from reporting of other crimes and existing guidelines developed by experts, what principles could be applied and tested in food tampering crime reporting to potentially reduce copycat behaviour? Moderate and limit reporting to not give it undue prominence. Offer consumers ways to protect themselves, e.g. cutting up fruit. Portray food tampering as a crime. Tell the stories of affected growers, industry and workers. Put the incident into perspective, e.g. we eat lots of fruit every day that is not affected. Help people understand the level of risk. Talk about what is being done to minimise harm, e.g. introduction of metal detectors. Don’t speculate on the incident/s or the perpetrator/s. Don’t talk about the motive of the perpetrator/s. Don’t repeatedly show images that effectively show the method. Don’t sensationalise the crime or use language that over-dramatizes the situation. Don’t make the perpetrator famous by focusing on them. Now these are by no means proposed guidelines, they are a starting point for a conversation about how we can communicate food tampering in a way that most effectively reduces harm and best reduces copycat behaviour. Clearly the safety of consumers is paramount. If consumers know about potential threats and how to respond to them, this can reduce harm. A tick in favour of reporting food tampering crimes. Similarly removing suspect food from the food supply chain can also be effective. Many strawberries have been recalled, but withdrawing supply is not a long-term solution and could not be broadly applied or sustained across multiple fresh fruit products. And, lastly, we can work to reduce the actual incidence of food tampering occurring. Looking at ways to do this through how we report and respond to food tampering crimes should be on everyone’s radar wrapped up in this issue or responding and reporting on it. While I don’t know the answers to how we should report food tampering crime to reduce harm, we can, and should, look to find them. If not to help with the current issue, then to help respond to future incidents. I’m certainly going to do some more digging to find out what I can discover. And if there are any researchers out there who have looked at how to report food tampering to reduce copycat behaviour and minimise harm – please get in touch – I’d be interested to learn more. But I cannot finish here because despite the strawberry tampering frenzy that has swept across us, it seems that it has been the community that has come to the rescue. Using social media (#smashastrawb) as a force for good we are seeing Aussies take on the challenge – encouraging family, friends, neighbours and colleagues to “Cut ‘em up, don’t cut ‘em out” (I’d like to congratulate the person who came up with that!). It’s a simple message that the first reports could have led with. Who knows, maybe we would have had a different outcome if they did. Thanks to Mark Paterson and Susan McNair for their helpful insights in editing this blog and to Tom Davies for his research contribution. Duncan CM (2015), Eat, drink, and be wary: how unsafe is our food? Scherer CW (2003), A social network contagion theory of risk perception, Risk Analysis, Vol 23, Issue 2 (Pages 261-267). Sophie wants to make the world a better place and believes that by improving agricultural systems, conserving natural resources and supporting rural communities we can do this. She is passionate about evidence-based insights into communication, agriculture and the environment and applying those to help farmers become more productive, profitable and environmentally sustainable.